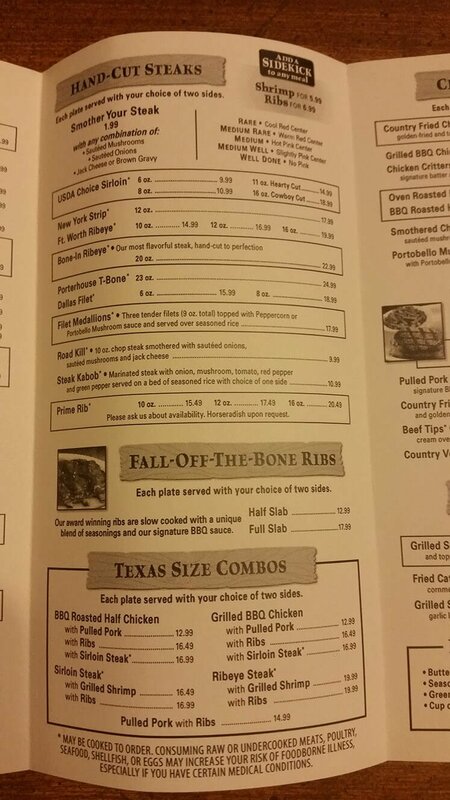 Here is your source for the Texas Roadhouse® menu with prices. 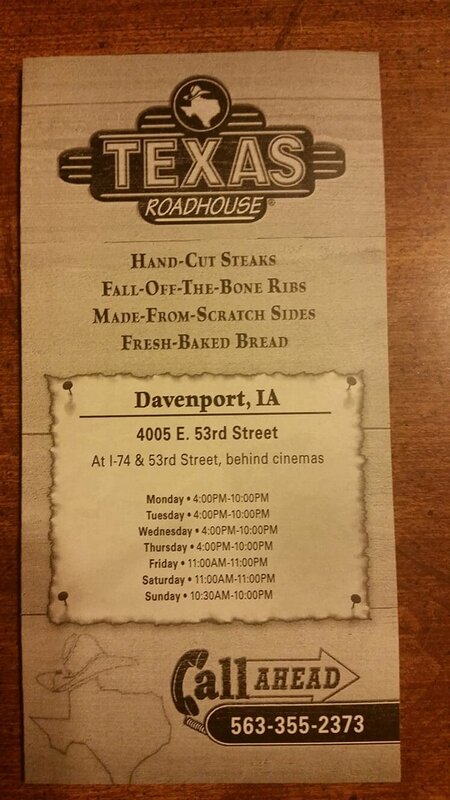 You will find amazing steaks and more served in a casual restaurant with a Western theme at Texas Roadhouse. The staff is extra warm and welcoming, which will make you feel right at home even if you are a Yankee. Some Texas Roadhouse venues even offer live line dancing by the staff to famous country music hits. You will find hand cut steaks, and everything made in house from scratch (with the exception of some of the special kid’s menu items such as hot dogs). Bread, such as their famous sweet yeast rolls, is baked on site. If you suffer from peanut allergies, you may want to skip Texas Roadhouse. Peanuts are served to guests in the shell in open pails for munching before their appetizers arrive so there is a potential for a peanut reaction even if you don’t partake directly. May be cooked to order. Consuming raw or undercooked meats, poultry, seafood, shellfish, or eggs may increase your risk of foodborne illness, especially if you have certain medical conditions. Served on a toasted Texas-sized bun with steak fries and pickle spear. 1/2 lb. fresh ground chuck with lettuce, tomato and onion- Add sweet & zesty sauce at no charge. 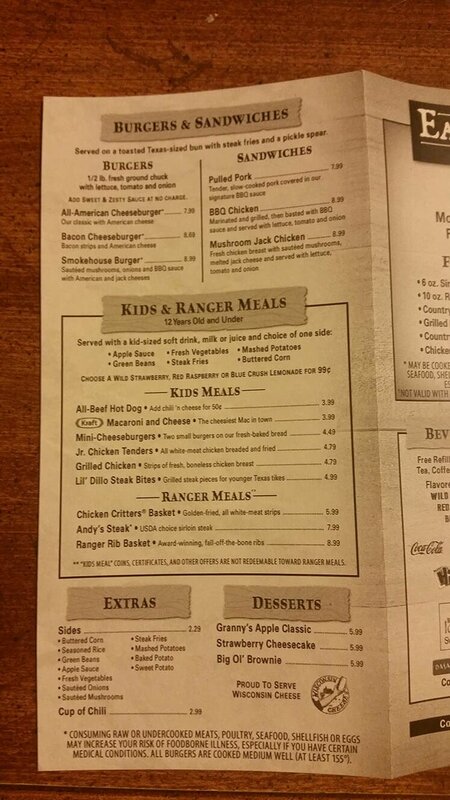 Kids meal coins, certificates, and others offers are not redeemable toward ranger meals. $8.99 per meal. 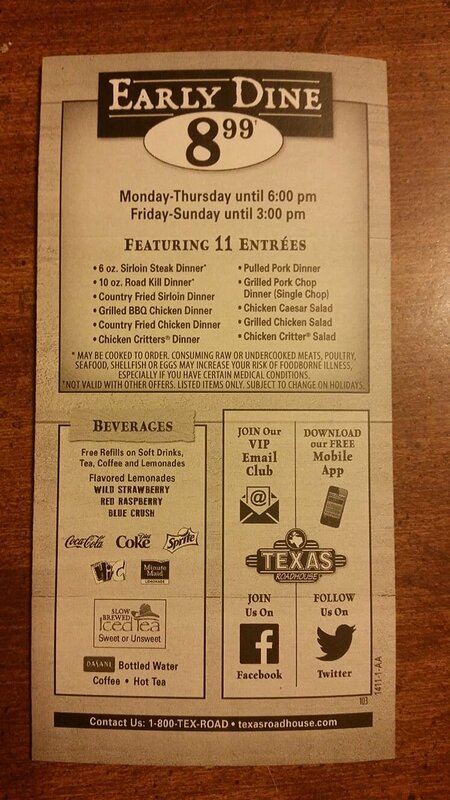 Featuring 11 Entrees. Monday-Thursday until 6 PM. Friday-Sunday until 3 PM. Although famous for incredible steaks and tender ribs, Texas Roadhouse also serves up chicken, seafood and other country favorites like pork chops and Country Fried Sirloin. All of the side dishes are made from scratch on the premises and there are plenty to choose from. 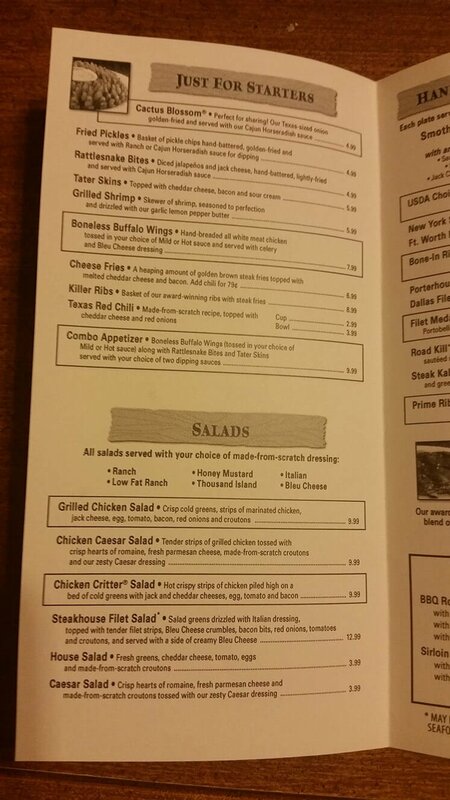 If you are looking for lighter fare, the salad menu is a good place to start. Grilled Salmon is also a good choice, and you can have it with a baked potato and a side salad. There is a kid’s meal section as well, making this a great choice to bring the whole crew. Don’t worry, there is no snake on the menu at Texas Roadhouse! This fun starter is made from cheese stuffed jalapenos which are battered and fried to a golden brown and served in a Cajun horseradish dipping sauce. $4.99. The ribeye cut of steak has the best marbling for the most succulent and rich steak. This steak is hand cut on the premises and never frozen so you know it will be tender and delicious. Have it smothered in sautéed mushrooms for an extra $1.99. A monster 16 ounce cut is available for $19.99. If you are looking for lighter fare, but still want to partake of the delicious steak at Texas Roadhouse, consider this hearty salad. It starts with fresh salad greens, blue cheese crumbles, bacon bits, tomatoes and croutons and finished with grilled stripes of tender filet. $12.99. Don’t miss this special meal of hand cut pork chops specially seasoned and then grilled. We recommend this dinner with a side of sweet potato and Apple Sauce. A single chop dinner is $9.99, but if you have a hearty appetite, go for the double chop dinner for $13.99. Backed by an $80,000 investment by Kentucky Governor John Y. Brown Jr., W. Kent Taylor opened the Buckhead Hickory Grill in Louisville, Kentucky in 1990. When a second location was being planned, a falling out among the partners forced Taylor to change the name and he named the second location Texas Roadhouse, located in Clarksville, Indiana. By 2004, when the chain went public, Taylor and his investors had expanded the chain to over 65 restaurants. In 2011, the chain opened its first location abroad in Dubai. As of 2015, there are about 450 Texas Roadhouse locations. Fun Fact: The Texas Roadhouse in Port Chester, New York once offered a $1,000 reward for information pertaining to the theft of a stuffed armadillo named Ol’ Dillo that belonged to a member of Willie Nelson’s crew. 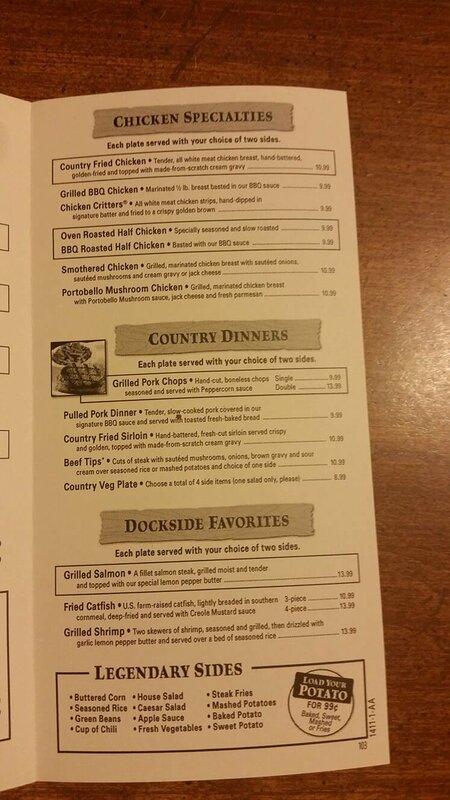 Texas Roadhouse menu prices are subject to change without prior notice. Prices shown in images & the following table should be seen as estimates, and you should always check with your restaurant before ordering. Texas Roadhouse menu images sourced via e-mail from restaurant customer & menu-price.net user. menu-price.net does not guarantee the pricing or availability of any menu items listed in image or table format on this page. Pricing may vary from location to location.